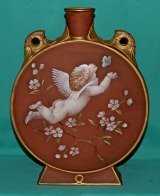 Despite the fact that the firm of Alcock was very large by comparison with many contemporary Staffordshire factories, their wide range of porcelains has only in recent years attracted the serious collector. Samuel Alcock owned the famous Hill Pottery at Burslem as well as a separate factory at Cobridge. 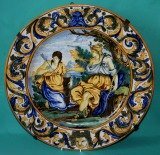 His name is more readily assosiated with red earthenwares with black decoration in the style of early Grecian wares then with porcelain. 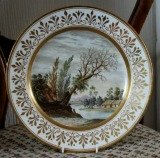 The Alcock bone-china body is of good quality , well potted and often very richly decorated, even with encrusted flowers in the Coalbrookdale manner. 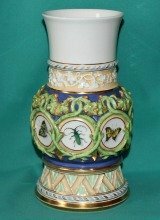 In 1833 the factory employed more than 400 people and their 20 kilns equalled those in use by Minton. 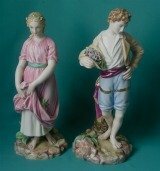 Apart from some portrait busts and other models made in unglazed biscuit china, most of Alcock's useful porcelains of 1830-40 are unmarked. That is why the firm is so little known and why many of its productions are wrongly classified as Rockingham or Coalport. The quality is there - but not the maker's mark. 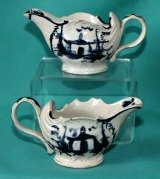 Samuel Alcock was displaying his wares at the 1851 Exhibition with a wide range of dinner and dessert services, tea sets, sentrepieces, spill vases, relief-moulded parian jugs, single figures and groups. 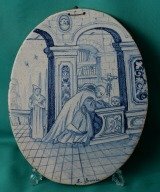 A good selection of useful earthenware was also made at this period. 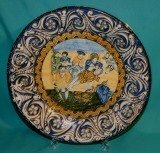 A Samuel Alcock part Dessert Service, comprising five plates with richly decorated pierced border, the centre painted with landscape scenes c.1840. Dimensions: 23 cm. diam. marks: Pattern 2/5718 in puce. Condition: one plate with a hairline. 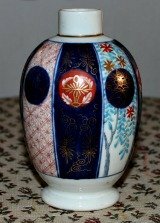 * This pattern is illustrated in " Godden's New Guide to English Porcelain" 2004 by Geoffrey Godden, page 51, plate 52. 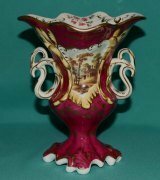 A Samuel Alcock Porcelain Vase c.1835 of rococo form with moulded scroll handles and borders, the front central panel painted with a landscape, the reverse with a bouquet of flowers on maroon ground and fine gilding. 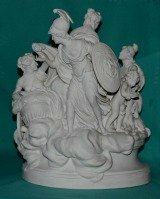 Dimensions: 19 cm high. Pattern 186 painted on the base. Condition: minor flaking on the enamels. 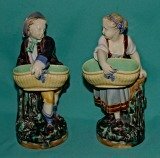 A Pair of English (Possibly by S. Alcock) Porcelain Candlesticks c.1840, of rococo shape, painted with bouquets of flowers on cobalt blue ground. Dimensions: 19 cm high. Marks: Pattern 2/3437 in green. Condition: One candlestick with a chip on the rim. 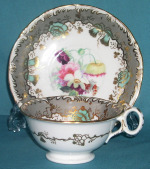 S. Alcock porcelain tea cup and saucer c.1835 of "Adelaide" shape, decorated with enameled flowers and gilding. 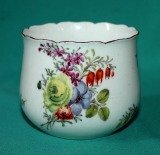 Dimensions: cup D.10.5cm, H.5cm. Saucer D.14.5cm. Marks: Pattern 734 painted in red. Condition: A tiny hairline on the handle. 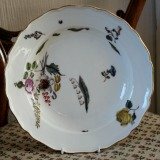 A S. Alcock bone-china dessert plate c.1835-40, painted with flowers surrounded by a grey ground border. 23cm diam. Unmarked. Excellent condition. An unusual shape dessert plate c.1830, with a pierced border and "melted-snow" edge, pained with enamel flowers. 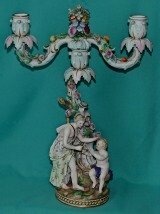 Pattern number 8083 in gilt and painter's mark in purple. Faint hairline near the rim. 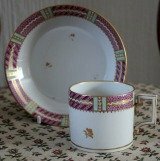 A S. Alcock empire shape Cup and saucer c.1830, decorated with a pink ground, elaborate gilding and enamel flowers. Cup: 5cm. high x 9.5cm diam, Saucer: 15cm diam. Pattern Number 971 in gilt. Fine condition. 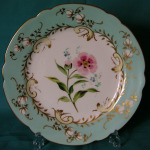 A Samuel Alcock porcelain dessert plate made in the first half of the 1850s, decorated with hand painted flowers on a turquoise ground. D.9"(23cm). Marks: Pattern number 3/4722. Fine condition.